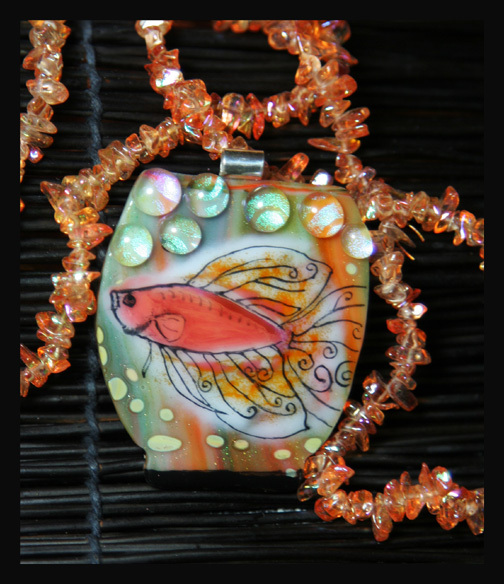 Home STUDIO All jewelry designs AUTUMN IN THE PACIFIC NW…AND A BETTA PENDANT ! AUTUMN IN THE PACIFIC NW…AND A BETTA PENDANT ! This fall has been a picture perfect one here in Portland. We were a little scared at first when 2 weeks of rain hit far too early but then Mom Nature blessed us with one of the most beautiful Indian Summers we have seen in our 10 years in the Northwest! On of the prettiest sights this time of year is when the wine vineyards start to change color. We have a “wine country” region that rivals some of the best in the nation for scenery and those classic rolling hills that the grapes love to grow on. Here is a shot I just took in the McMinnville OR. area. The grape leaves were at their peak! And on a jewelry making note!! Check this one out!!! My betta “Mango” keep whispering in my ear to make a betta pendant so here goes!! This was quite the accomplishment given the fact that glass just doesn’t want to “flow” this smoothly in the kiln. I will be posting this beauty on the website this week. Enjoy the weekend everyone and keep checking the website. I have 8 new bead bowls ready to list and 3 wonderful pendants too!! Thanks for stopping in! !